"Advantages Of The Laravel Framework For Developing MVC Based Web Applications"
"Which Is Better For iOS App Development: Swift Or Objective-C?" Shopping is an easy task these days. With m-commerce surging, shopping online is so easy that all you have to do is download the app, spot the product and pay for it! It's like an easy three-step process. Yes, on the outside, it may seem that way. But when you take a closer look, you will know that it is not so easy. Most m-commerce applications today take the help of third parties for efficiently completing the payment part. Today, there is a countless number of applications for almost everything - almost each of the major brands has their own Android and iOS versions of mobile applications that best feature their brand or business. But when it comes to payment apps, I guess the number would go down definitely. Online payment is indeed the most important part that requires a great deal of attention. That is because, if the bank details or card details fall in the wrong hands, then all is gone and it’s a nightmare. That is why probably we don't hear so many payment apps coming up. Instead, businesses use payment gateways from third parties for their payment services. 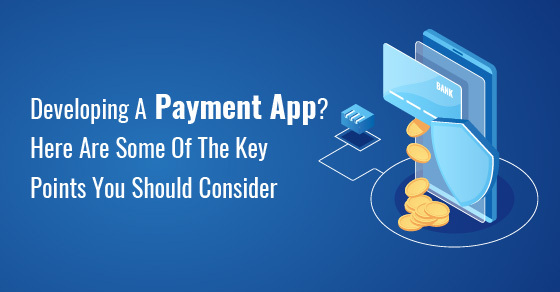 But if the creation of a payment app is in your mind, then this is a must read for you - in this write-up are some points that you should keep in your mind. If you take a look at the different payment applications that are available now, you will notice that one of the most famous and most successful mobile applications is Paytm. I am sure that you all are aware and might even be using it. If you have a Paytm account, you can almost pay for anything now and don't need cash or card. But developing such a successful app is not an easy task. As said before, it requires a tremendous amount of work and concentration. Since it is with financing that you are about to play with, you definitely need to be very careful too. Key points to consider while developing a payment application. People who use their mobile phones and payment applications, want things to finish up quickly and in a very simple way. So, when you are developing a payment application, your goal should be to develop an app that will serve its function in short and few easy steps. This is one aspect that you cannot compromise on. While creating a payment app, you cannot afford to accommodate even a small mistake. With cyber attacks and threats growing, giving a small space can open doors to cyber crimes that steal away bank accounts and personal details leaving you behind with a lot of angry users. Hence, security should not be compromised during app development and as well as after development. Today, one of the issues that users face is their confusion on where all can the application be used. While developing the app, ensure that you implement a location-based service so that the app will alert the user regarding all the nearby stores and places where your payment app can be used. When a user decides to use the payment application, they also wish to know where and what is happening to their money; be it a transaction failure or even a success. Thus, keeping your app's users posted on their payment status will increase their trust. I am sure that you would have got several coupons that could be redeemed when you made a purchase. If you look around, redeemable coupons are like the trend now and it is showing no signs of slowing down. Hence, when you develop a payment application, make sure that you keep room to accommodate redeemable coupons as well. The sensitive nature involved in the task - development of payment applications is one of the reasons why not many have come up, unlike the apps that are launched frequently by other brands and businesses. But by keeping these points in mind and by being careful, developing a successful payment application is not an impossible task.